The cycling and beer Gods were shining down on me this past weekend. I happened to be in Santa Fe, New Mexico, during the Outside Bike and Brew Festival. Having previously lived in Santa Fe while working at Outside Magazine, it's always been fun to come back and see how the trails and my own riding have evolved. Santa Fe must be on your bucket list–if not, you're missing out on some insanely good riding. 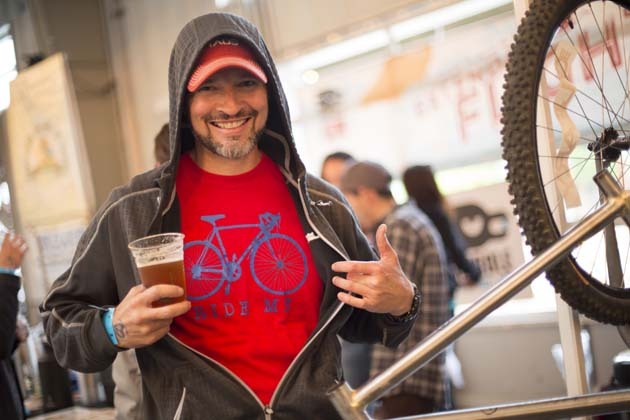 Now in its second year, the festival aims to meld craft-brew culture and cycling. Its cool factor lies in its ability to blend sensibilities, combining the best of a bike festival and the best of a beer festival without either overshadowing the other. You can dip in and out of the festival if you care a little bit about bikes and a lot of beer or vice versa. Chris Goblet, craft beer ambassador for the state of New Mexico (a.k.a. coolest job ever), conceived of this festival while he was at the 17th Annual Brewers Rendezvous in Colorado back in 2013. 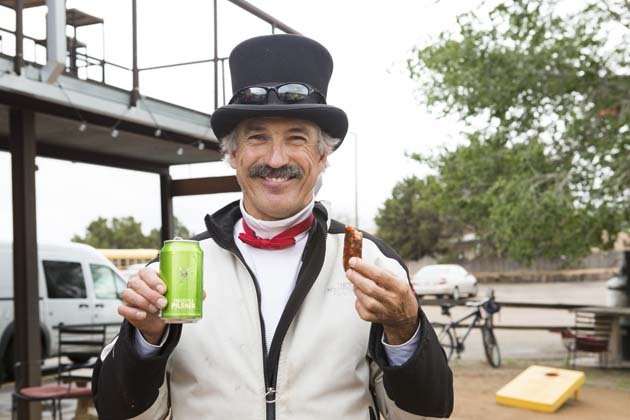 He and some bike industry guys from Santa Fe-based distributor BTI shredded Colorado's legendary Monarch Pass, then celebrated the sweet singletrack by raising a few glasses of world-class craft brews. The perfect blend was born. Santa Fe is eager for the momentum this event brings. Last year's Bike and Brew donated a portion of the proceeds to the Fat Tire Society to build a flow trail that debuted at this year's festival. Such an addition puts Santa Fe in the running for IMBA Gold-level status, an upgrade from its current silver standing. The flow trail is a fun addition the new La Tierra network located on the edge of town and home to the La Tierra Torture XC race. On each day of the five-day festival, attendees have their pick of rides, clinics, tours or expo events. Friday included a Tour de Brewer, an cruisey ride that stopped at Second Street Brewery and Blue Corn Brewery hosted by the respective brewmasters. If you wanted some tips on the trail, Utah-based pro and avid homebrewer Eric Porter led rides at the La Tierra trails. The setting was super casual and more of a conversation with him and less of a clinic. In between organized tours, you could knock out a few laps on the portable pumptrack in The Railyard, where the festival was centered. Eric Porter knows how to pass the time on the way to the trailhead. Those who weren’t up for the organized rides could tackle local favorites on their own, like Winsor, a classic Santa Fe climb with a little bit of everything–buffed-out singletrack, rooty, rocky sections and several creek crossings. A must-do local loop is the Winsor-Borrego-Burn Loop. You can check it out here. I've done versions of this loop over the years and it never disappoints. The lung-busting climbing pays off with some fun, fast flowy singletrack. Depending on what time of year you're riding be sure to check the snow levels and at the very least pack layers. Across town, the Dale Ball trails were base camp for Rebecca Rusch's SRAM Gold Rusch Tour all weekend. This trail network was perfect for coaching since it has such a stellar variety of singletrack terrain. There’s hard-packed dirt, loose marble sections, waterbars to power up and over, as well as tricky roots and rocks. 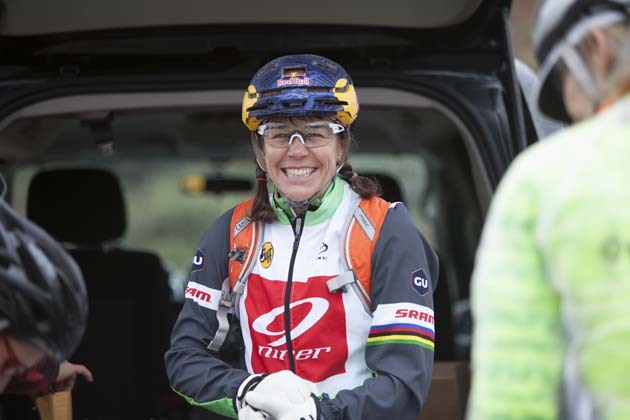 Rusch had an all-star women's line up teaching the clinics, including decorated downhill mountain biking legend, Leigh Donovan, ripper Lindsey Voreis who runs the Liv Ladies AllRide Tours and Sarah Jarrell technical marketing director at SRAM. The Queen of Pain shows no pain despite blizzard-like conditions during her Gold Rusch Tour stop at the festival. Her students didn’t let a little rain stop them either. Leader Leigh Donovan keeps the ladies stoked. 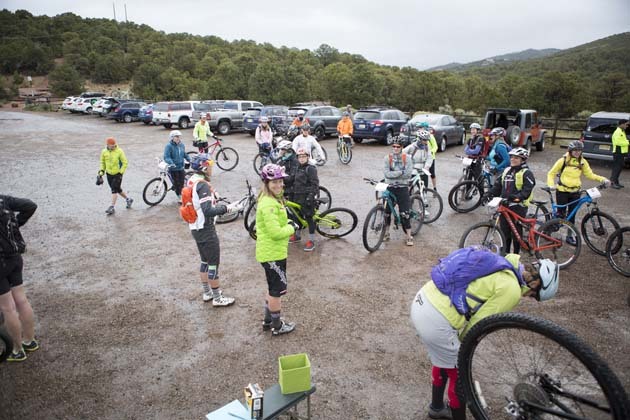 Despite the crazy mix of mid-May mountain weather, some 6,000 festival-goers braved rain and snow to sample the trails or cruise through expo, which included such exhibitors as SRAM, REI, Bolle, Niner, UpCycle, Monsoon, Mountain Flyer, Gates, Wheels MFG, Landarets, ReGeared, ACS BMS, Borealis, Nite Ize, DT Swiss, EcoMotive, REI, Thrive and Rough Rider 200. If food and beer was on tap for the day instead of serious riding, the Culinary Cruise showcased some hot new spots with stops at The Barrio Brinery for pickled delights, Cheesemongers of Santa Fe, ChocolateSmith and its chocolate-chile bark, and finally, Draft Station featuring New Mexico's finest craft beers. There was also plenty of eye candy to peruse at the Handmade Bike and Handcrafted Beer Showcase. At the end of the day, beer dinners and tap take overs sated tired riders. Santa Fe is known for its exceptional cuisine, ranging from high-dollar restaurants to quick and easy food trucks. At the beer tasting venue held at the local farmer's market warehouse, La Cumbre, an Albuquerque brewery, had the longest line with the Elevated IPA as a crowd favorite. Marble, another local brewery, partnered with Audubon New Mexico to help protect New Mexico's riparian habitat by promoting a new beer called Extended Flight Red Light Lager. The new brew is the first in a series of healthy habitat beers that will support Audubon's river conservation efforts throughout the state. "Supporting river conservation is a natural fit for a brewery because without water, we couldn't make beer," said Ted Rice, head brewer and president of Marble. 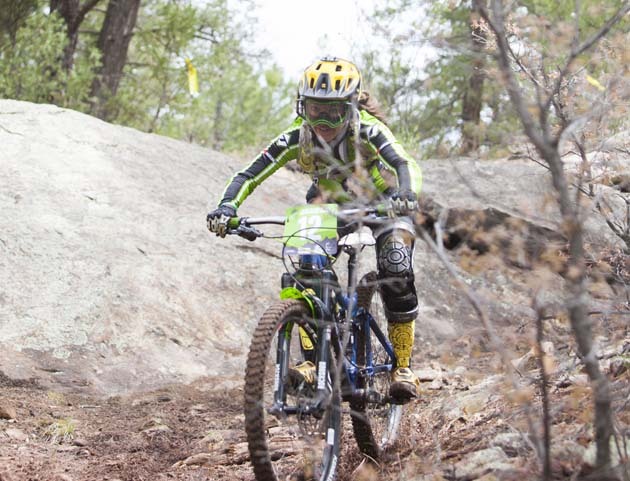 By the final day of the festival, the weather had cleared to make way for classic Santa Fe sunny skies, just in time for the enduro race on the newly expanded Glorieta trails. The beer and music finale included a pop-up Marble Brewing taproom, an ideal backdrop for local band Rose's Pawn Shop. Mike Chapman, a local shredder and owner of Broken Spoke Bike Shop, raced the inaugural enduro on Sunday. "The Enduro was a blast but the conditions were incredibly challenging,” he said. “The heavy rains throughout the weekend made the dirt road, un-timed climbs full of bike-clogging, clumpy mud. What should have been mellow dirt road climbing become a carry and push fest. It sucked, but we all had to deal with it and in the end, it just makes the whole experience more memorable. The courses were awesome, all-natural terrain with a great combo of pedaling and technical riding. Muddy conditions in the morning that dried by the afternoon made this a true enduro, testing fitness and skills. This was a very well-run event and the vibe among the racers was great and very supportive." With the stoke factor higher than ever, next year promises to be the best year yet. Good introduction to altitude trails, not too steep or technical, but fast, flowy and perfect for singlespeeds. Very good signage and close to town if you need a quick ride and home to the newly built Flow Trail. This is a fantastic 22-mile trail network, well-built and crawling all over the foothills of the Sangre de Cristo Mountains. It's a ride complete with twisty tight singletrack, technical switchbacks, short punchy climbs and tight trees that come packed with amazing views of both the surrounding wilderness and the town below. The range of trails is astounding for how close to town the network is, and it hooks up with the Atalaya Trail. What's so cool is traffic goes both ways on the trail depending on what you are in the mood for. La Chamisa starts out with a nice singletrack climb directly from the trail head. You'll climb in the sweet smells of the pinyon forest that eventually hooks up with the Windsor trail. It's a good idea to warm up before you start this climb, or just be ready to bust a gut straight away. The climb follows a valley up to a saddle where you begin your descent into the Big Tesque Basin. This will have you smiling as big as the New Mexico sky. The average grade is 6 percent, and maxes out at 17. Beautiful singletrack, relatively gentle climbing along the creek complete with open meadows, aspen groves and thin air as you get higher. If you have your 10,300-foot altitude lungs packed, hit this up straight away from the bottom. Or shuttle to the top and bomb down, but be on the lookout for uphill trail traffic and use a bear bell. If you start from the top you'll drop 3,400 tongue-wagging feet in 10 miles, finishing down in Tesuque. This full-service shop sells new and used bicycles as well as all the essential accessories and apparel. Service is definitely the heart of their operation. Every employee is an experienced mechanic and no job is too big or too small. Most importantly, no judgments made, they treat everyone with respect no matter what bike you roll in on. 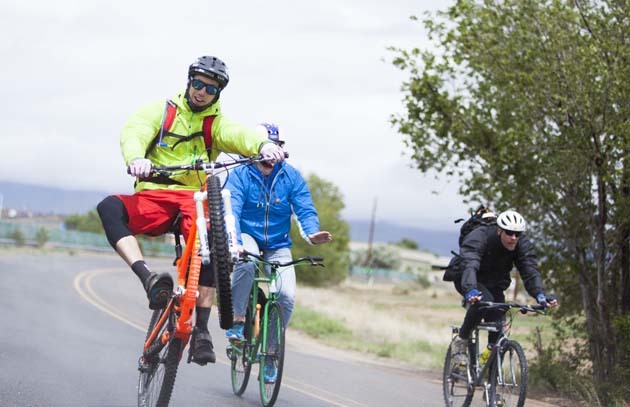 Longtime Santa Fe resident Tony Farrar will get you stoked for a ride. His love of mountain biking is infectious and he knows about the latest and greatest gadgets and bikes out there, as well as all the trails and secret stashes. They have a great rental fleet stocked with high-end mountain and road bikes, which you'll get properly fitted on once you choose your weapon. Bring your own pedals, and they'll install them, or check with them ahead of time as they may have what you need. While you're waiting head downstairs for a game of ping pong or check out the hipster selection of apparel. This hidden gem pulls perfect espresso and features Portland-based Stumptown Coffee Roasters. Owner Tom Frost likes to fly under the radar with advertising, pouring all of his energy into the crafting the perfect cup. Be sure to check out the locally made road bike frames hanging on the wall. Free WiFi. They have two locations in town, and pride themselves in micro-roasting small batches of 30 pounds or less and are the OG Coffee Roaster, having opened in 1984. The St. Francis location has a drive up window. Free WiFi. 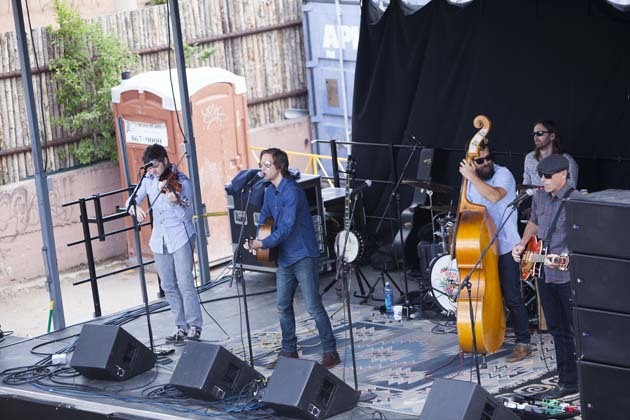 Santa Fe's only Native American-owned hotel is located in Historic Downtown and just a stone's throw from the Santa Fe Railyard District, which is basecamp for the Bike and Brew Festival. Santa Fe Motel & Inn has 23 quaint rooms/casitas tricked out Santa Fe style, with hand-tiled baths and Southwestern furnishings. Do not miss out on the complimentary breakfast; it will not disappoint. Black Canyon is tucked in a Pine/Douglas-fir forest, about 20 minutes from town, and is close to the Chamisa Trailhead for some great singletrack riding. This is a tent-only campground about 10,000 feet up in the Aspen-Fir zone of the Sangre de Cristo Mountains. About 35 minutes from town, it's close to Aspen Vista trailhead and you can fall asleep to the lullaby of two streams that flank the area. Definitely a hot spot for breakfast, lunch and dinner, complete with beer and wine list. Don't let the line scare you: the service is lightening fast. Breakfast is hopping on the weekend with bottomless coffee and delicious breakfast burritos. Order hand-style for on-the-go, or smothered for a sit-down feast. Hailed as one of the best breakfast burritos in town, I dare you to eat it all in one sitting. Go for the Christmas Chile. The Counter Culture Cafe features two outdoor patios with refreshingly modern decor if you've had enough of the Southwest style. Open for breakfast, lunch and dinner. Hot new gastropub masterminded by two locals that celebrates fine dining and craft beer. Enjoy a craft beer from New Mexico or Colorado at the bar. Cool pub hangout vibe that offers comfort food and a selection of small and interesting craft beer pairings. Best deal in town on a custom breakfast burrito to stuff in your pack for an all-day ride, only 5 bucks. Be sure to go next door and get your espresso at Betterday and start your ride off right.